Oct 23 2014 (IPS) - Rafiqa Kazim and her husband Kazim Ali had a simple dream – to live a modest life, educate their four children and repay the bank-loan that the couple took out to sustain their small business. Until early last month, their plan was moving along steadily but now Kazim says they have “hit a roadblock”, which took the form of deadly floods that swept through the north Indian Himalayan state of Jammu and Kashmir on Sep. 7, killing 281 people and destroying crops worth millions of dollars. According to government estimates the overall damage now stands at some one trillion rupees (16 billion dollars), in what experts are calling the worst ever recorded flood in Kashmir’s history. The National Disaster Response Force (NDRF) said this was the first time the force was called upon to respond to such a severe flood in an urban area. By the time the floodwaters had receded and the Jhelum River had returned to its usual steady flow, much of Kashmir’s capital Srinagar was underwater, with 140,000 houses destroyed and hundreds of thousands of others badly damaged. It has been over a month, but families like the Kazims are only just starting to come to terms with the long-term impacts of the disaster as they move slowly out of makeshift camps, shelters and relatives’ homes to start picking up the pieces of their lives. 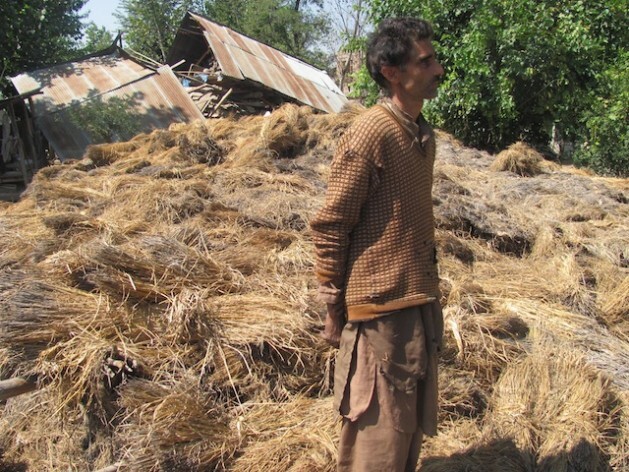 Making her way through the wreckage of her home in Ganderpora, 17 km northwest of Srinagar, Kazim points out the damage to their house and one acre of agricultural land. But in truth, her mind is elsewhere – on the 10X10-foot carpet that she and another weaver had been working on for over two months. For Kazim, this carpet represents months of labour, and the promise of grand profits for a woman of her economic background: in a single year, she can earn up to 200,000 rupees (about 3,350 dollars) from carpet weaving and embroidery. In a country where the average annual income is about 520 dollars, according to the India Human Development Survey (IHDS), this is a tidy sum. “As the announcement came on the community address system that flood waters were entering the village, our first instinct was to save ourselves and get to a safer place. In the process, we forgot everything else including the loom, the carpet, as well as our floor mats and bedding,” she explained. The loss of the loom could mean dark days ahead for the couple. Kazim only took up the practice of weaving and embroidering when Ali lost the use of his right arm due to a neurological disorder, preventing him from continuing with his job as a videographer. Reluctant as he was to pass the onus of breadwinning onto his wife, Ali soon realized he had no choice. He sold his beloved camera, and pooled the money together with a 1,500-dollar loan to purchase the loom and various other tools Kazim would need to convert their home into a small handicrafts unit. Their first order, for an eight-by-seven-foot carpet and assorted embroidered clothing items, brought the family nearly 1,250 dollars, which enabled them to pay their children’s school fees and set something aside for repayment of their loan. Now, the floods have swept away their hopes of making ends meet, including the limited harvest from their small plot of farmland. “I have no idea how to get things back to normal,” a dejected Kazim concluded, looking around at her three daughters and son. She is convinced that unless government support is forthcoming, families like hers will be looking at a bleak future. Indian Prime Minister Narendra Modi marked Wednesday’s Diwali holiday, a holy Hindu festival of light, with a visit to the affected areas, where hopes were running high that he would announce a generous aid package to flood victims. In an already poor state – with 2.4 million out of a population of some 12 million people living below the poverty line – the impact of a natural disaster of this nature is gravely magnified, leaving the destitute far worse off than they were. Things are particularly bad for farming families, who constitute 75 percent of the state’s population and lost some 512 million dollars worth of agricultural products in the floods. Some 300,500 hectares of crops were also destroyed, spelling trouble for landholding families who generally own just 0.67 hectares of farmland. Until official assistance kicks in, women like Kazim will be forced to bear the brunt of the floods, since the responsibility of managing domestic affairs is seen throughout traditional Kashmiri society as a woman’s job. In most of the flood-hit areas, it is the women who are fetching water for their families, cleaning homes of silt and mud, retrieving cooking utensils and generally making sure that life gradually returns to normal. Finding clean drinking water is proving a particular challenge, with many sources such as wells and water supply tanks damaged and contaminated by debris washed up by the floodwaters, which reached heights of up to 25 feet in some areas according to the NDRF. For the average family, which consumes about 500 litres of water per day, this poses countless challenges on a daily basis. In Haritara Rekhi-Haigam, a village located some 60 km north of Srinagar, IPS witnessed women struggling with all these challenges. Some residents told IPS that several women had been injured while attempting to fill their buckets from a water tanker, as scores of people jostled for a place in the line. 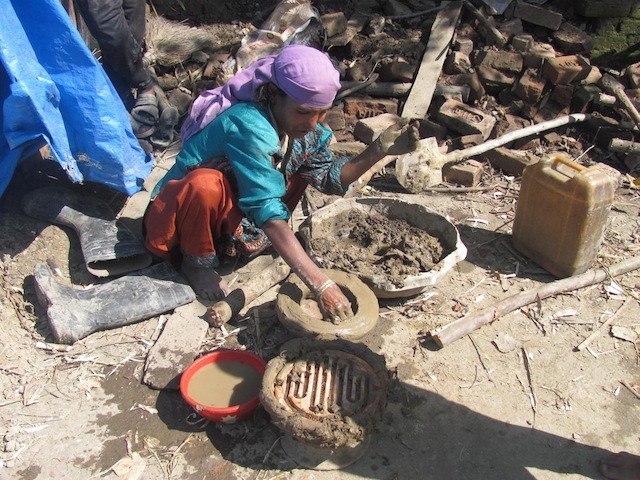 Many women in Haritara Rekhi-Haigam must now walk over four km each day for a single pitcher of water. IPS spoke with a group of young girls carrying heavy pots on their heads, who said they set out at daybreak for a return trip that lasts over five hours. Women like 49-year-old Hajira Begam are coming up with unique solutions to their problems. She shows IPS the earthen insulation she has rigged up over an electric coil, which allows her to boil water to clean her cooking utensils. She has also created a makeshift structure over a portion of the roadside that serves as her only shelter since the flood has washed her house away. She is one of some 100,000 people left homeless by the floods. Women must also see to their children’s education, no simple task given that the floods damaged as many as 2,594 schools, with some 686 buildings left completely uninhabitable. A school teacher named Nahida Begam told IPS that her family still has not found permanent housing, with some renters demanding as much as 423 dollars “for two rooms and a kitchen” she said. With a combined monthly income of about 900 dollars, and two children to educate, she and her husband cannot afford such a high rent. With the winter approaching, bringing with it the promise of weather that falls as low as minus ten degrees Celsius, “it is likely that people are going to die of cold in the coming months for want of shelter,” according to Mehbooba Mufti, president of the opposition Peoples Democratic Party (PDP). And with the onset of winter, those with humble dreams like Rafiqa Kazim will be hunkering down to plan for a future that, for the time being, holds very little promise.